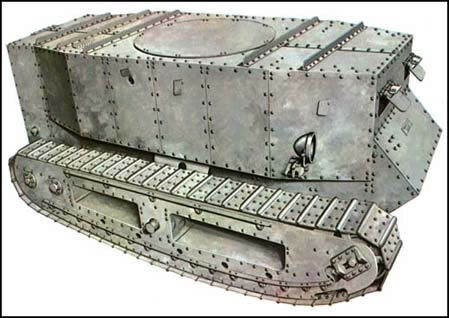 The idea of an armoured tracked vehicle that would provide protection from machines gun fire was first proposed by Colonel Earnest Swinton based on his observation of trench warfare. Rejected by the Army, his proposal was sent to Winston Churchill, the then navy Minister, who set up the Landships Committee in February 1915 to study the possibility of breaking the trench deadlock by creating a 'Trojan Horse' for transporting soldiers into enemy lines. This Committee went beyond this original concept thought to be impractical and together with the newly formed Inventions Committee, produced a specification for an armed vehicle and fighting platform. 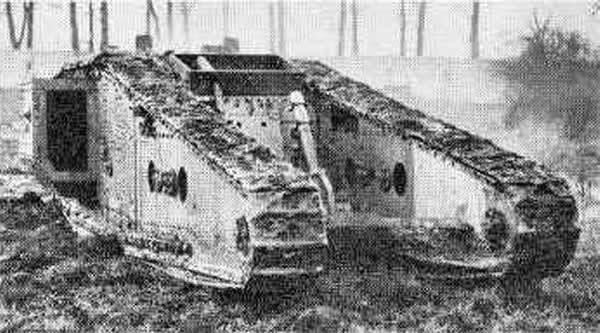 The specification included: (1) a top speed of 4 mph on flat ground - the speed of marching infantry; (2) the capability of a sharp turn at top speed; (3) a reversing capability; (4) the ability to climb a 5-foot earth parapet; (6) the ability to cross a 8-foot gap; (7) a vehicle that could house ten crew, two machine guns and a 2-pounder gun. 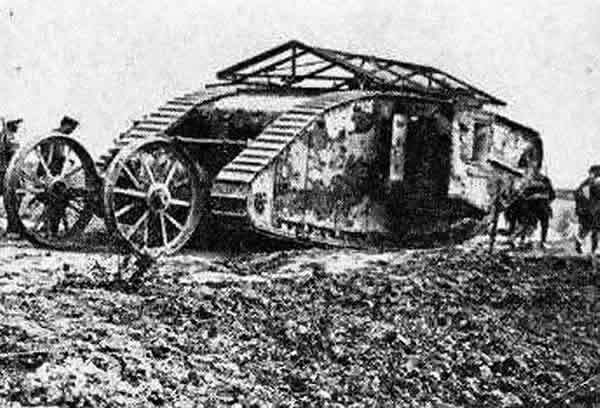 The first prototype completed in December 1915 was an unarmed tracked vehicle called 'Little Willie'. 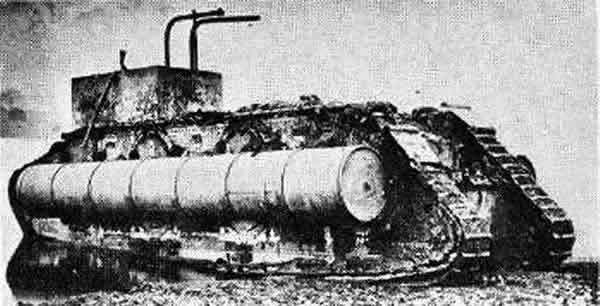 Already it embraces all the principles of later tanks such as tracks running the whole length of a fully-armoured body. A revolving gun turret was envisaged but this was dropped when it would make the already 10 foot tall vehicle too high. 'Little Willie' was 12 feet long and weight 14 tons. It had a crew of three and a top speed of 3.5mph on road and half that across country. 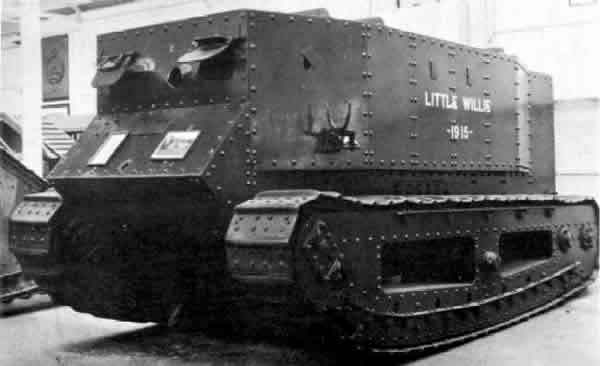 It was apparent that 'Little Willie' was fine as a test bed but a new design, already in development, was needed to turn it into a fighting vehicle. The second design and prototype, called 'Big Willie' or simply 'Mother', was completed soon after 'Little Willie'. Based on a rectangular box hull similar to 'Little Willie' sandwiched by more radically rhomboidal shaped track frames that carry the tracks right round the hull. A set of rear wheels or limber trailing the main body was used to help with steering. 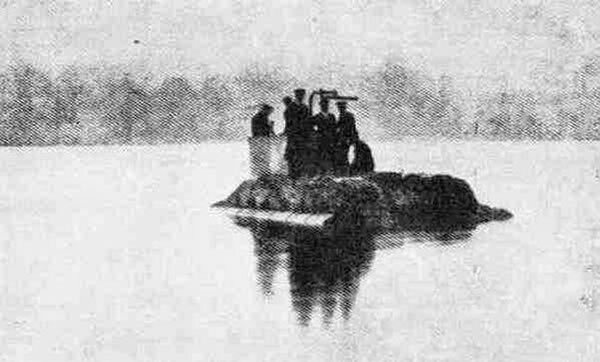 It ran for the first time on January 1916. 'Big Willie' had a crew of eight; four to operate the tank (driver, gearsman, 2 brakesmen) and four to operate the armament (2 gunner, 2 machine-gunners/loaders). 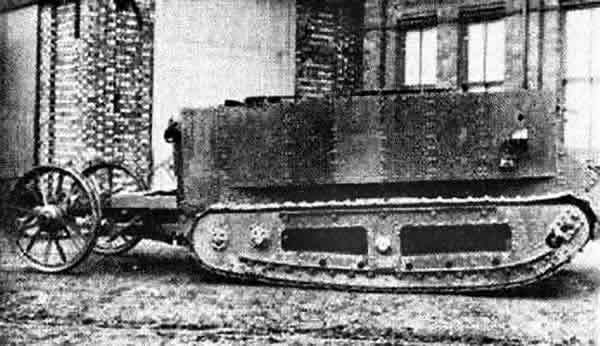 It had 10mm of frontal, 8mm of side armour and can travel at just under 4mph. Because of the already considerable height, the rotating turret idea was dropped in favour of 'sponsons' blistered into the sides of the hull carrying the main armaments; twin 6-pounder or 57mm guns sourced from the Navy. It was intended that these sponsons can be removed from the production model for transport. During the design stage, there was some doubt expressed as to whether gun-armed vehicles would be able to hold off attack by massed infantry so it was decided that half of the production would be 'females' carrying .303 inch Vickers machine guns in place of the 6-pounder guns on the 'males'. The female was armed only with machine guns and was intended for attacking enemy personnel and light fortifications. The male was armed with machine guns and two 6-pounder naval guns. The intention of the male was to attack other gun emplacements and strong points. When the German start to deploy their own captured tanks in April 1918, some 'females' were fitted with a male sponson containing a 6-pounder gun on the right side so that they can defend themselves. These conversions were known as 'hermophrodites'. A new unit known for security reasons as the Heavy Section, Machine Gun Corps. Was formed to man these vehicles in May 1916. Though originally called 'The Landship', for security reasons, these vehicles were designated 'Mobile Water Tanks' for desert warfare during manuafacturing and shipped to France from England labelled as 'Water Tanks' thus giving them the name by which they have been known ever since. 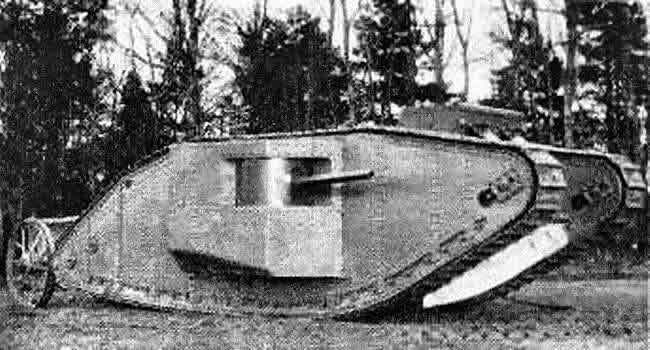 After successful trials of 'Big Willie' during the early part of 1916, one hundred (later increased to 150) of what would become known as the Mark I tank were ordered for deployment in France. Half was to be completed as 'males' and half as 'females'. No lights were fitted inside the Mark I tank and ventilation was poor. The tracks did not have suspension or any mean of shock absorption. The resulting noise, smoke and heat within the gloomy and confined interior produced an extremely exhausting fighting environment for the crew. Communications between crew members were only possible by hand signals. Significant improvements to overcome these deficiencies and also as a result of combat experience were introduced in the subsequent Mark II and Mark III. Otherwise they were identical except for minor changes. Frontal armour was increased to 12mm to overcome German armour-piercing bullets. The rear steering wheels proved impossible to use in comabt and was discarded from November 1916. Mark II Improvements included a wider track link in every 6 to increase movement performance on soft ground. Mark III Improvements included a raised manhole hatch on the top of the hull and late production vehicles has a smaller sponson and a lower calibres and therefore shorter 6-pounder gun as was later fitted in the Mark IV. Production of Mk. I, Mk. II and Mk. III tanks were limited to 200. 100 were Mark Is, 50 Mark IIs and 50 Mark IIIs. Armament: (Male) 2 x 40 calibres 6-pounder guns, 4 x 8mm Hotchkiss machine-guns. (Female) 4 x .303in Vickers machine-guns, one 8mm Hotchkiss machine-gun. The female sponson was slightly larger than the male. Armour: 10mm frontal (increased to 12mm from Mk. II onward to overcome German armour-piercing bullets), 8mm side (increased to 10mm). 6mm top and rear. Dimensions: Length 32ft 6in, width 13ft 9in (male) 14ft 4in (female), Height 8ft half inch. Combat Weight: 62,720lb (28,450kg) for male, 60,480lb (27,434kg) for female. Engine: Daimler six-cylinder inline water-cooled patrol engine developing 105hp at 1,000rpm. Performance: Speed 3.7mph (6.95km/h), range 23.5 miles (37.8km), vertical obstacle 4ft 6in (1.35m), trench crossing 11ft 6in (3.45m), gradient 24 percent. The Mark IV is perhaps the best known of the First World War Tanks. The Mark IV retained the same classic Rhomboidal shape and incorporates the improvements made since Mark I through Mark II and Mark III resulting in a much improved and more effective fighting vehicle. Outwardly the Mark IV appears little different to its predecessors but there were many detailed changes. The crew compartment was better ventilated and extra escape hatches were fitted to the roof as well as the sides. A silencer was fitted to the exhaust to reduce the noise level inside. Engine power was up-rated but still underpowered and the fuel system improved. Range was increased by more patrol being carried in armoured tanks outside of the top of the hull toward the rear. Running gears were strengthened in key places and the tracks widened with studs added to some track links to improve traction. 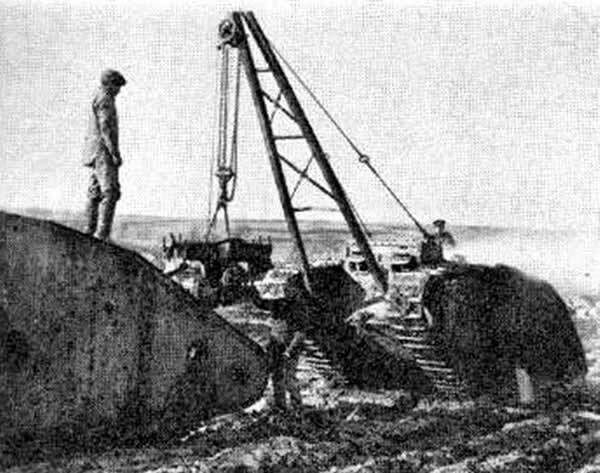 A rectangular unditching beam used to overcome obstacles was carried as standard on top of the tank along a new set of rails. Mark IVs have lower 23 calibres (from previously 40 calibres) main guns with shorter barrels to eliminate the danger of the muzzle being dug into the ground when crossing wide trenches. Both the male and female sponsons were redesigned to stop the botton leading edage catching when passing over rough ground. For a time, .303in Lewis machine-guns were installed due to shortage of the Hotchkiss Machine-gun. The wide cooling jacket around the Lewis guns proved to be susceptible to small arms fire and also requires larger holes to be cut into the armour. The sponsons on Mark IVs were hinged to allow them to be swung in for transport. 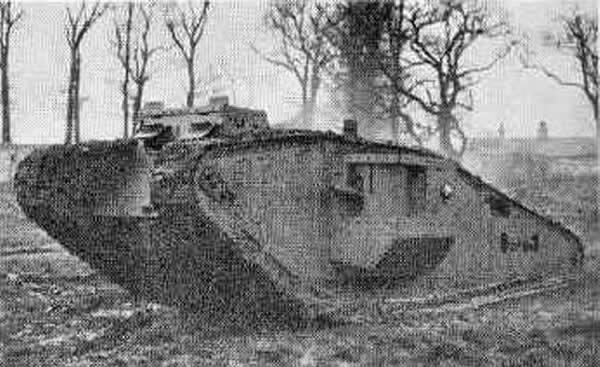 The Mark IV became the workhorse of the tank corps from September 1917 to the end of the war. 420 male and 595 female Mk. IVs were produced in total. 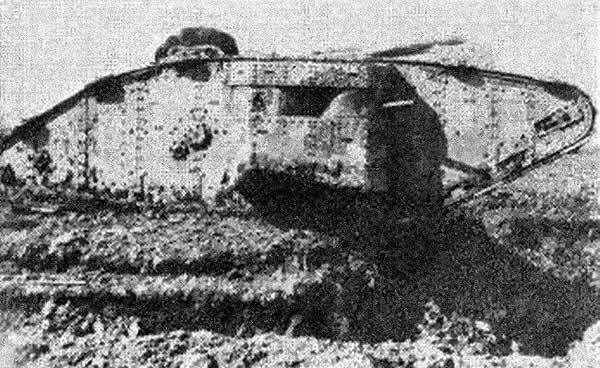 Some Mark IVs were fitted with an extended 9 feet 'tadpole' tail to increase the trench-crossing ability. Armour: 14mm frontal, 12mm side. 8mm top and rear. Dimensions: Length 26ft 5in, width 13ft 9in, Height 8ft 2 inch. Performance: Speed 3.7mph (6.95km/h), range 35 miles (56km), vertical obstacle 4ft 6in (1.35m), trench crossing 10in (3.0458), gradient 24 percent. The Mark. 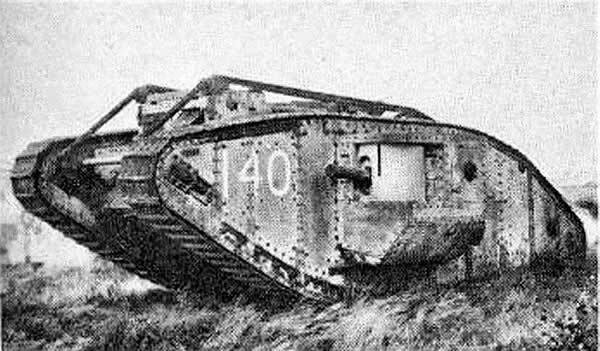 IV was followed by five later marks of the now familiar Rhomboidal or lozenge-shaped tank but only the Mark V was produced in any significant quantity. 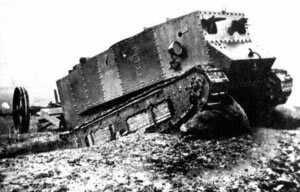 The Mark V was an improved Mark IV and it was the first heavy tank that could be driven by one man without the need for others to work the gears and brakes through a new drive and gear system. Some Mark Vs were fitted with an extended 'tadpole' tail to increase the trench-crossing ability similar to the Mark IVs. Many variants of the Mark V were developed to fulfil various roles on the battlefield including carrying supply, recovery of damaged tanks, bridge laying, mine clearing and laying fascine to allow wide trenches to be crossed. In total, 200 male and 200 female of the various Mark 5 variant was produced. 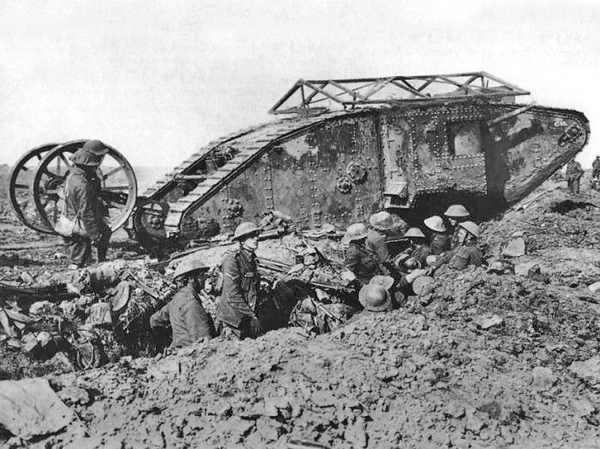 The Mark V* was a widen version introduced in 1918 that can carry an additional 24 infantrymen. 200 male and 432 female of the Mark 5* variant was produced. There were also Mark V** and Mark V*** variants but few were built and none were introduced to combat. The design of the Mark VI was a radically departure from previous heavy tanks. It was smaller, lighter and faster and the main 6-pounder gun was to be located low and front of the hull. Five machine-guns were to be installed in support two of which were in small side sponsons. Only a mock-up of this vehicle was ever produced. The Mark VII was an experimental design. It was the first to have an electric starter. Only one was ever produced. 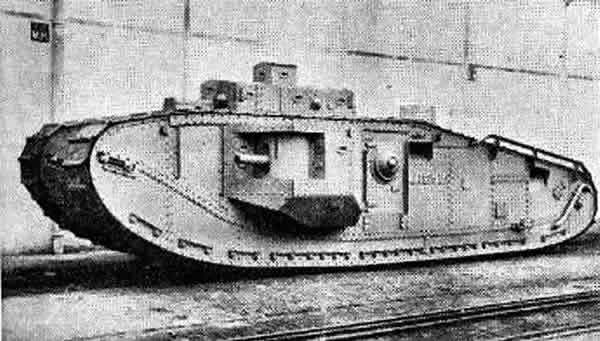 The Mark VIII began life as a joint venture between Britain, France and the United States of America to supply 1500 tank to the new United States 'Tank Corps' being established in the Summer of 1917. By the time all the fine details were agreed on, the war ended and the French left the partnership. Only a few prototypes was completed. The United States decided to go ahead anyway and produced 100 Mark VIIIs alone. The Mark VIII was referred to the Anglo-American or Liberty tank. 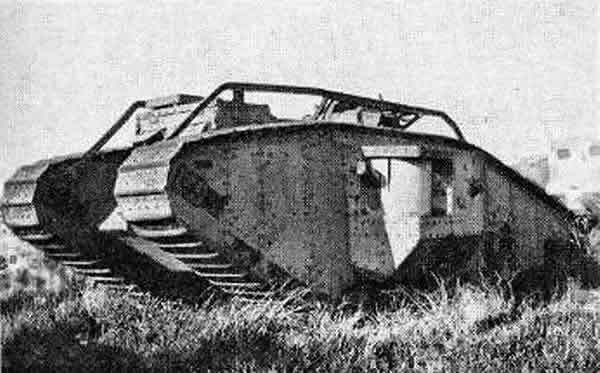 It was was an enlarged and improved version of the rhomboid-type heavy tank, with better track, greater trench-crossing ability, and a powerful Ricardo or Liberty V-12 engine in a sealed engine compartment generating 300/340 bhp. It carried a crew of 11. The Mark VIII remained in service in the U.S.A. until the mid 1930s undergoing various upgrades during it's life to improve and extend it's service capabilities. This was perhaps the best design to emerge from the series. The Mark IX was designed to be an infantry supply vehicle rather than a fighting machine and due to its ungainly appearance became known as 'The Pig'. 'The Pig' was large enough to carry 50 men or 10 tons of equipment. Plans for 200 were called for buy only 23 were ever made. The machine had large side doors and a large load area but was very underpowered and suffered from poor performance. In 1919, one 'Pig' was made amphibious and called 'The Duck', by adding a raised cab, flotation devices, and a modified exhaust. Propulsion was provided by a motor at the rear and paddles attached at various intervals on the tracks. By 1919 these large, heavy, slow-moving and vulnerable vehicles were obsolete and were replaced by lighter and faster models. 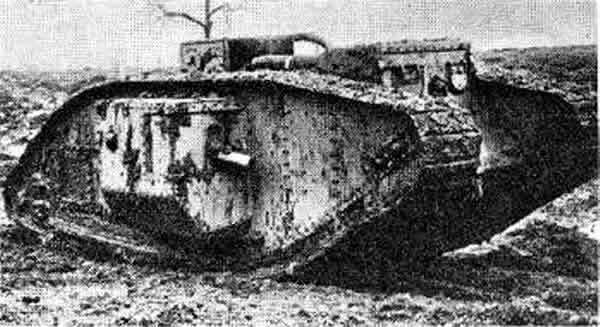 Tanks as we know it today in the form of the Mark Is were first deployed in anger in September 1916 by the British. Original plan was to deploy the tanks in a massed attack to achieve surprise and to maximise its shock value. Out of an initial force of 50 tanks, only 36 made it to the start line due to mechanical failures and other defects. Only a very few of the original force reached their objectives but those that did keep going, swept all opposition before them. Despite an inauspicious beginning, the observing army staff was sufficiently impressed to instigate ordering 1,000 of the new fighting vehicle thus safeguarding the role of the tank on future battlefields. Do you find this useful? Email us your feedback. What else would you like to see?